Another disingenuous move by CPF Board? I believe many of us are not aware of this as I don’t remember receiving any letter(s) from CPF Board on this. I have just check with CPF Board website & this is the truth. 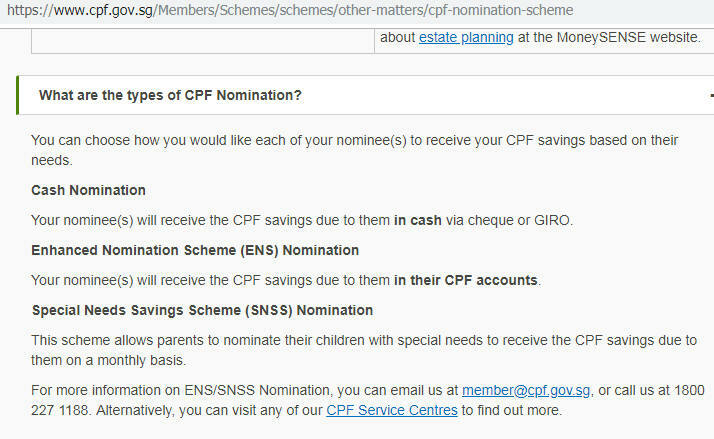 So I suggest all of you to review your CPF nomination(s) & amend it to cash distribution. Everybody please note (as far as I understand), when we kick the bucket, all our balanced CPF money will not be automatically deposited into our nominated Next-Of-Kin (NOK) bank account in CASH. CPF board will instead send all your balanced CPF money to your nominated NOK’s CPF MEDISAVE account. There is a separate form to be filled if cash or cheque is required. 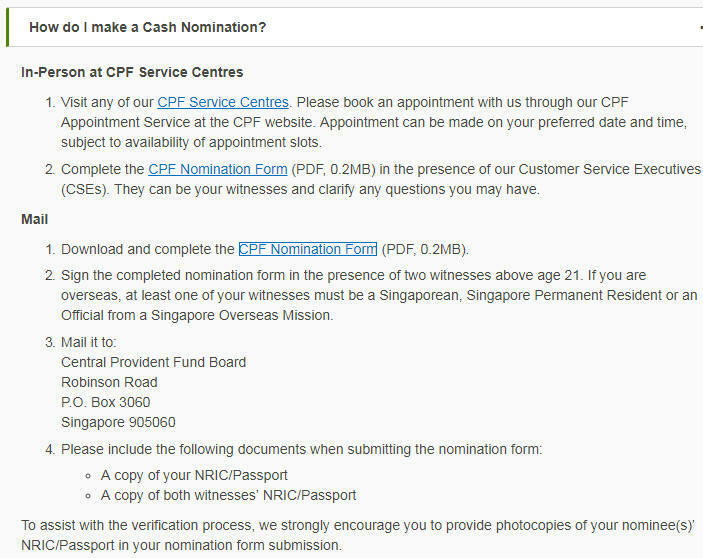 Die die CPF will not give to NOK the CASH…But WILL PUT IN TO THEIR MEDISAVE ACCT… UNLESS U READ UP THE FINE PRINTS. Better go check if our nominations are cash ones. Please circulate to families, friend and colleagues. * Editor’s note: There is indeed a separate section on the official website detailing how to make a CASH nomination, suggesting that CASH is not the default payment method – although it is not expressly stated. It is a good practice to always check with CPF whenever in doubt. In GE2015, 70% voters gave PAP a blank cheque to do whatever it wanted. Let’s see in next GE, we could be like the Malaysians, doing the right thing. Malaysian is going to know what happens the 1MDB. Will Singaporean going to know what happens in our Reserve, CPF, Temasick and GLCs. Don’t depend on the Indian masquerading as a Malay President to know or wants to know anything. She is only interested in her monthly bank account!! Next GE, we need to do the right thing. Do we still want this government? One thing I have learnt from my and many other’s experience in dealing with CPF is to NEVER ASSUME anything especially when it involves CASH and PAYMENT. CPF’s default policy is to ALWAYS find ways to prevent as little CASH PAYOUT as possible to its members, if no need to pay at all, lagi better. 1. If MOF is giving out GE goodies and you are away, once the cheque expires, the amount is by DEFAULT credited into your CPF OA account which you cannot withdraw. Why not MEDISAFE account which at least can spend on compulsary Insurance and hospitalization? My advice is to ALWAYS EXPLICITLY state what is required of CPF when dealing with CPF matters and NEVER EVER ASSUME anything. Even if their counter staff tells you anything, ALWAYS VERIFY from official sources and get it in writing especially if the matter involves CASH. Be VERY WARY if your questions asked cannot be answered directly or they attempt to side-step in any query to CPF. This usually means that what you have suspected may be true or the staff simply don’t have the answer. NOT that I have anything against local CPF staff, but I heard that most counters are now manned by FTs who has absolutely no idea what he/she is talking about. Oh BTW, someone just informed me that should I kick the bucket, ALL my usable organs WILL BE harvested without my consent, UNLESS I EXPLICITLY opt out. Dunno if that joker snooking me or not lor. Its hilarious and sad at the same time to think our G is so ever ready to grab every last drop of blood / dollar from its citizens.. When they want to take from us , so easy.. But time to give , its like pulling teeth! The organ donation is true..its been on record for some time now, unless you opt out. Organ-harvesting has an official name in national legislation, and it is called – drum roll, please, The HOTA Act! 乎乾, pronounced ‘ho ta’ in the Minnan tongue/Fukienese, means clear out everything, leave it empty, leave nothing behind; how apt (for them, those harvesters), hahah. (If you still have any so-called LIFE left in the little stinky pool of the leepahlee of sinkeverpoorer, that is, haha. It’s true. If you don’t want your organs harvested have to fill out an opt out form from hospitals. Of course, the form will say that if you need an organ transplant after you opt out, don’t expect help. @TRE techie, u can obtain the opt out form or in writing at any hospital. Are u kidding us, that you didnt know such things? Cannot be,right? Tech: Truth be told, not in Singapore since Donkey years ago. YOU ARE DEAD RIGHT and it is NOT just CPFB – anything that involves CASH AND/OR PAYMENT to CPF and HDB, the peasants had better open their eyes BIG BIG. TRE Techie: One thing I have learnt from my and many other’s experience in dealing with CPF is to NEVER ASSUME anything especially when it involves CASH and PAYMENT. It is a MOVING FEAST unreachable for peasants – an illusion of promises, yes, promises they will take back by their default rules in dictatorship extraction of assets belonging to peasants. HDB grants will have to be returned via resale levy later when you buy another of either your upgrading or downgrading. AND CPF is another deception leaving peasants to chase an EVER SHIFTING DELAY AFTER DELAY AND FURTHER DELAYED of withdrawable entitlement age AT CPF Board’s sole determination and in drips-fed (just like you are dying in the ICU of hospitalisation stay) of an annuities which the CPF members have not elected of choice. The asset enhancement politics is a mother of all rotten scam transferring wealth from the poor to the rich. AND TO ADD SALT TO WOUNDS, 70% of the daft Sinkies are TOO STUPID TO EVEN BEGIN TO DISCOVER THEY ARE STUPID TO IMPOSSIBILITY. How did we got indoctrinated to come to this darkness of entrapment of EVER MOVING FEASTS? not everyone knows or remember what abbreviation is. So please kindly name it and put the abbreviation within brackets please. It’s all about sense and sensibility. //Oh BTW, someone just informed me that should I kick the bucket, ALL my usable organs WILL BE harvested without my consent, UNLESS I EXPLICITLY opt out. Dunno if that joker snooking me or not lor. just a hilarious loud thinking. just like you go into another person’s house and start take away his stuff (money, movable items, etc) and then tell him if he needs to inform you first before you start to take away his stuff, of else everything belongs to you lor ? welcome to the wonderful logic of opting out system (what a efficient way to provide institutions the easy way out of getting things done at your expense lor ?). INSIST on speaking to senior managers getting reply in black and white marked copy to ministers or mps. well, the white idiots keep on changing the rules on cpf quite often right that one can be reasonably confused on the subject matter ? and this is not helping at all especially rules that many feel uncomfortable about and not to their advantage ? daft sinkies should also know how to display the kind of hunger in the way the white idiots love about FTs who can be street smart troublesome sometimes ? Had just checked the nomination form. Where is the option to indicate CASH? Any advise? We are feeling unsafe now for our children. Mod: There is a seperate nomination form for cash. allegated. Information remained gagged. Accountability is exempted. What a system? Now the AGC referred to sibling case to LS n why not bring it to the Court of Laws. Rather weird. Could all Senior Councils rationalize the move? Any advice from the top presidential advisory council. I have raised the same awareness and alerted my elder brother on this same matter. My elder brother attempted to ask the cpf employee himself. He came back with the answer as “No such thing”…but he never came back with a CLEAR ANSWER and DEEPER UNDERSTANDING or EXPLANATION by the Cpf employee / staff !!!! I agree with the writer,….when you “sense hesitation” from cpf employee’s reply….means there is some “catch” that they have been told “not to over assist” !! If I was wrong,…then I suggest that CPF should “debunk” what the writer above as mention !!! No “debunk”by cpf within the next 14 days…means “Guilty” as predicted !!! by right, it should. but the white idiots always have something ‘smart’ up their sleeve. it is quite clear from anecdotal evidence that the white idiots are trying to prolong the withdrawal in cash (inventing all sorts of monkey rules) as far as possible into the future. Makes one wonder what the hell had gone terribly wrong. Even when got cyber attacked they are afraid to reveal the culprits…why? Official Opt Out forms can be downloaded from the HOTA website. Yes indeed you need to opt-out. Get a form from MOH to opt-out. I did mine years ago when i knew that my free-organs does not result in free medical bill to those who will potentially needs them. My whole family opt-out. And we don’t care a hoot on the need of other’s organs. I receive a plastic opt-out card to certified that i am an HOTA opt-out person. Tech: That’s precisely the point. Why should the recipient be paying for an organ which was taken from someone without his consent? Of course if we make noise on this, they will say must pay storage fees, doctor’s cutting fee, etc etc etc. I have downloaded the form and will be sending it via registered mail when I get it notarized. Thanks for the information. in 2015 who did they voted for??? 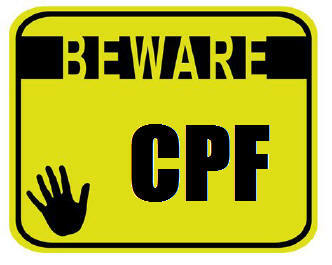 CPF fund is either paid in cash to the member’s NOKs or into their CPF acc – as had been decided by the member. Nomination is made only at CPF service centre and nomination must indicate the method of payment. Hence there is no default. If there is no nomination his fund will go to Public Trustee Board for distribution. IS THERE NOT SOMETHING WRONG WITH THIS? When a member nominated his NOK as the beneficiary, that estate/property rights immediately vested in ownership of the nominated beneficiary at the moment of the passing mortality of the member.. It is NO FIACKING BUSINESS of the trustee to decide where or what for that payment should take form of. Why? THE PROPERTY – at the member’s passing – belongs to the beneficiary. If the beneficiary wants to put back into his/her CPF account and to which particular sub-account, it is FOR THE BENEFICIARY TO DECIDE AND AT ONLY AT HIS/HER SOLE DISCRETION TO DECIDE. The trustee’s obligation ends of legal fiduciary ends only UPON THE EXECUTION OF TRANSFER OF PROPERTY RIGHTS to the nominated NOK-beneficiary. Until such time as the NOK/beneficiary appoints the trustee OR ANY OTHER via a fresh trust deed to act on his/her behalf, the TRUSTEE (CPFB) HAS NO BUSINESS OR LAW RIGHT TO INTERFERE OR INFLUENCE the NOK’s decision choice. Retiree: CPF fund is either paid in cash to the member’s NOKs or into their CPF acc – as had been decided by the member. Nomination is made only at CPF service centre and nomination must indicate the method of payment. Hence there is no default. If there is no nomination his fund will go to Public Trustee Board for distribution. OR IS TRUSTEE LAW AS OPERATIVE IN LEE-jiapore outside the rule of trustee law applicable and practiced for over 700 years in all Commonwealth law jurisdiction? Is this LEGAL (of deciding how the benefits of the beneficiary-NOK by the trustee-CPFB) of outside party interference way beyond the mandate of the deceased member’s original trusteeship arrangement? - be at the election of the the nominated NOK-beneficary AND NOTIFIED TO THE TRUSTEE THEREON since the member has already passed on.? REMEMBER THE TRUSTEE IN LAW HAS NO RIGHTS IN WHATEVER SHAPE OR FORM or any other rights to vary or worst still benefit from the trusteeship not agreed to by the member and except as defined in the trust instrument signed prior and agreed to as between the deceased member and the trustee. Is Temasick HOlding so short of cash that they need to resort to such unscrupulous sneaky tactic to hold back sinkies cash monies so many times? Let a lot of people around us who are near, at, or after 65years knows that if they need their CPF $$$, they need to go apply for it. Or else will be waiting until 70years if they have long enough life. We just have to let more of our seniors know what is going on. Policies keep changing and even I cannot catch up with it. Who knows someday someone will happily announce that the statistic shows that many did not withdraw at 65 years old and thus 70 years old will be the new official age? They do plan ahead isn’t it? I guess,using 70 years old as opt-out is a simple cost saving measure for automation to take place, pre-emptive action for coming changes to minimum age. As with everything else we only get the half truths. DISCERNING PUBLIC MINDS – unfortunately only a minority – have long known that PAPpypolitics and PAPpynomics are nothing but a meandering river of endless lies, scams and deception. Pravda Sinkieland is broadcaster publisher of 1% truth, 99% lies, fantasy and propaganda abetting. Fed up: As with everything else we only get the half truths. Slowly but surely, more and more in the social media are waking up.